distinguished member of the Naismith Memorial Basketball Hall of Fame (2011); won over 930 games (most wins in NCAA Division II men's basketball history); Known as the Shot Doctor across America, Coach Magee has worked with several current NBA players to help better their shooting performance. 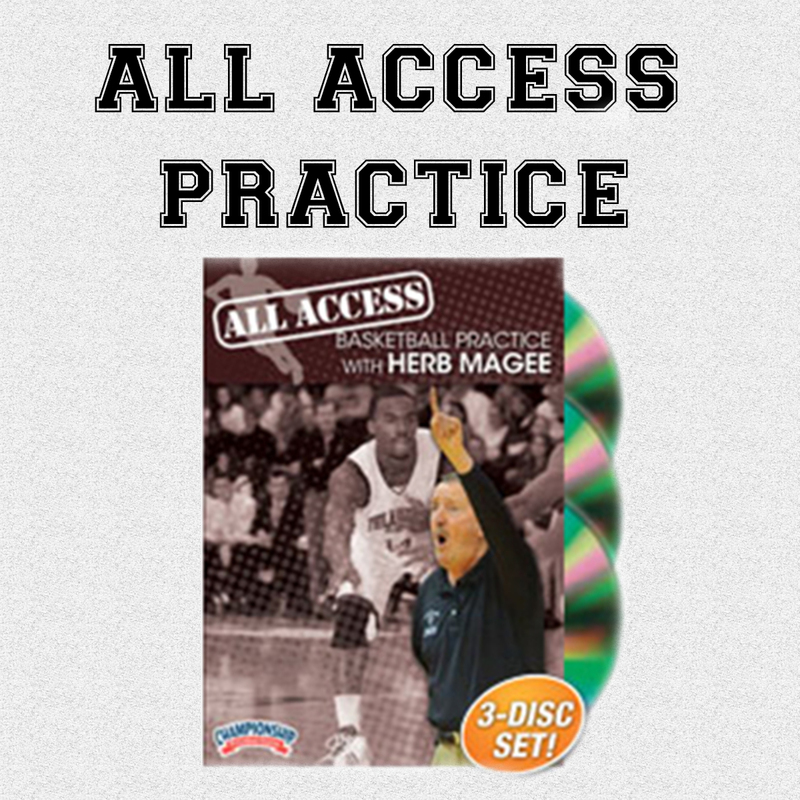 In this All Access DVD, Coach Magee guides you through their offense, defense, transition game, and player development all in the confines of three live practices. He demonstrates why he is one of the great basketball instructors as he details all the little things a player needs to be successful in his program and in the game of basketball. Magee provides an in-depth look at his shooting drills, giving a clear understanding of why he is referred to as the “Shot Doctor.” Magee discusses why he chooses certain drills and he provides an explanation of why he feels the drills are necessary for his current team. After getting loose, Magee continues to build his daily routine by having his players execute “Dummy Offense” to develop the rotational patterns of the fast break attack. Coach Herb finishes his daily practice routine by having his players focus on their rebounding skills using 1v1, 2v2 and 5v5 drill sets. Coach Magee takes his players through their daily shooting, rebounding, and transition routine and progresses right into three new offensive sets that are great if you have a consistent jump shooter or a solid post player. In Missouri, your post player and point guard run screening actions to get a back door lay-up or a post feed for an easy finish around the rim. In Cross'Em, Magee uses a guard crossing action to set up a backdoor play which is certain to get you a scoring opportunity every time down the floor. The offensive breakdown closes with a 5 on 5 scrimmage to simulate game-like actions and cuts against a live defense. On the defensive end, Magee reviews all of his ball screen situations and covers how he wants his players to properly closeout and play one-on-one defense. Magee has his players defend each ball screen situation in a 3-on-3 screen action. This session is sure to help you add a few sets to your playbook or help your players learn how to defend the most common screening action in basketball today. Building on the previous two practices, Magee teaches his players his out of bounds system. These sets are great if you are looking to get your best shooter or post player an easy bucket. Coach Magee finishes his third session by teaching his players a basic zone continuity set called 1-4 and has them run it against their patented 22 zone defense or a 2-3 bump zone. In their 1-4 zone offense, Magee looks to attack the short corner and high post with his post players as they dive and flash when the ball is reversed. 387 minutes (3 DVDs). 2012.